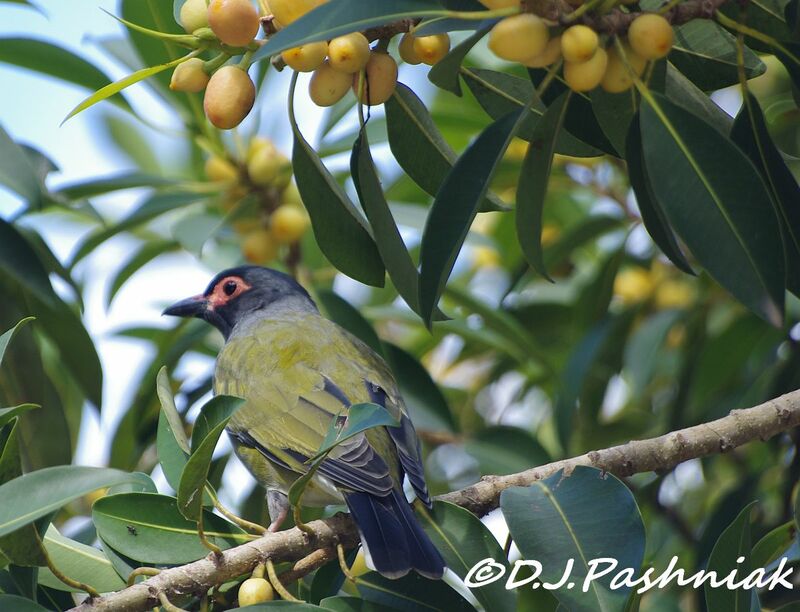 The other day a friend told me she had seen a lot of small birds in a Fig Tree that was covered with small figs at present. The small birds she had photographed were ones I really wanted photos of as well. When I went down the next day about 10am there were no birds at all in the tree! The following day I left it till the afternoon and there were birds all over the tree. Unfortunately they weren't the ones my friend had seen and photographed but any bush birds that sit still long enough for a photo are good birds! 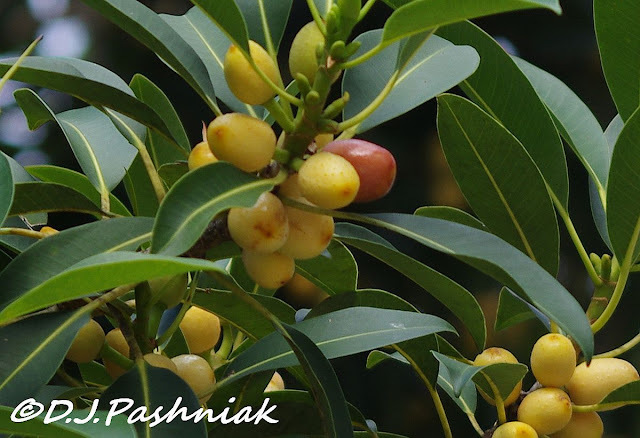 The tree is a native Fig - not the ones that people usually eat! When I looked up "fig tree" in my books about local native trees I found that there lots of fig trees that grow locally. Without more experience I couldn't ID it although a friend suggested that it might be a Ficus rubiginosa. 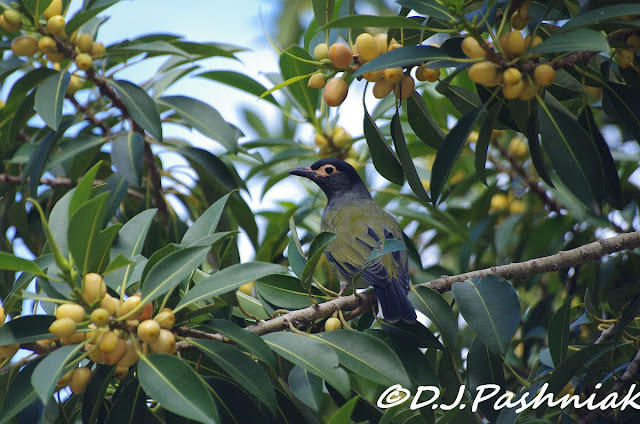 I have taken lots of photos of Figbirds (Sphecotheres viridis) but never before one in a Fig Tree. There were other smaller birds up in the very top of the tree but I couldn't see them properly in among the leaves. 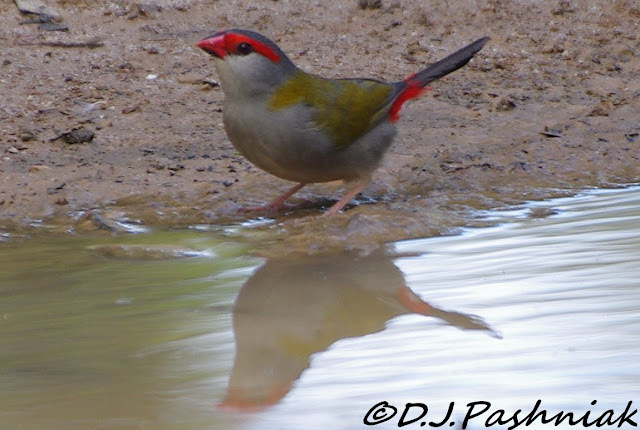 The only other bird I saw clearly was this little Red-browed Finch ( Neochmia temporalis) which was using a puddle to take a drink. I used to call this a Red-browed Firetail but my birdbook says it is a finch! Hello Mick, the birds are pretty and I like the fig trees. Happy Monday, enjoy your new week ahead! Great shots of the Figbird in the Fig Tree and the Red-browed Finch. Such wonderful colors on these birds. Your birds are too exotic I would pass out if I saw something like that! wow what beautifully coloured birds, I haven't seen that type of fig tree here, we do have them but just not that type. Hi Mick. With a bill like that the "finch" certainly looks like a member of that family. 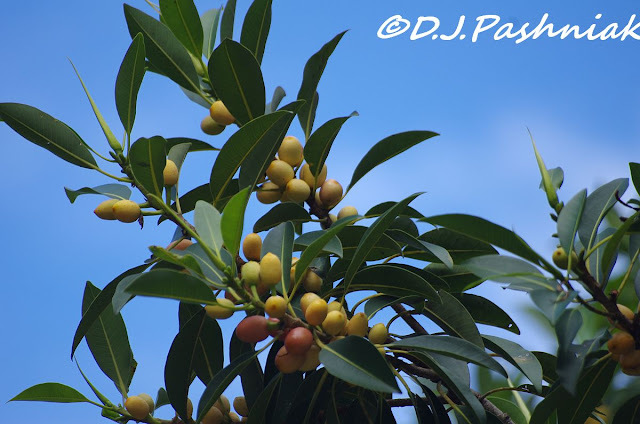 The figs look they are ripening and should attract more species of birds once they are? But I know in my own garden the birds of ten can't wait for ripe cherries and take the fruit when it's still yellow and sour to the taste. Great colors and wonderful birds. I'm sure you know that to see those two beautiful birds would put me in birding heaven! I hope someday you spot whatever bird it was that you wanted to see, but in the meantime, these two are simply stunning. And what a wonderful tree. beautiful figbird, but the redbrow is awesome! Great pics of the birds. Goodness, my finches don't look like yours. But yours are very interesting. That red-browed finch is gorgeous!!! The birds eating that fig are lovely too even though they weren't the birds you were expecting. Interesting "different" type of fig. Fantastic photographs, Mick! Anytime we find a fig tree around here with fruit it's almost certain there will be birds feeding in it. Those birds are new to me and really beautiful. Hope the upcoming weekend will find you out and about having fun! Lovely photos! Both birds are very pretty. Gorgeous photos, Mick!! I hope you are keeping well? Finch / Firetail - whats in a name - cracking looking little bird! That red-browed finch picture is AMAZING!!! Wonderful bird photos, new to me too. Your fig trees are very different from ours here, but the birds seem to get most of the fig when do ripen! Thanks for stopping by my blog.